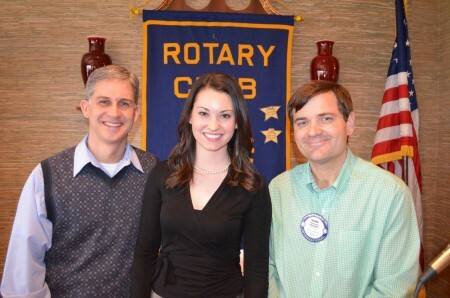 The Auburn Rotary Club heard a present from recent Rotary Ambassadorial Scholar Lauren Hayes, who attended Cambridge University for graduate school using Rotary scholarship funds. Hayes, who graduated in 2009 after serving a year as Auburn's second female SGA president, now serves as the advocacy director for the Tennessee Charter School Association. Pictured with Hayes is program host Steve Speakman (left) and club president David Reaves (right).